In inwise system you can create online form on landing pages which enabling forms to be produced easily, conveniently and quickly. All of this without any technology acknowledge. Edit & design form, explanation about elements. To add form to landing page, drag form element located in the element bar of the landing page. The default fields of the form are Full name, phone number and Email. For short text, such as name, surname, addresses, questions which the answer should be short, etc. Free text, Long answer or open questions, such as notes, opinions, etc. For add number, such as ID, age, car number, etc. In the settings you can change the title of the form. For update Email address with correct syntax and perform Email validation. While filling this field, the updated phone number is verified by the contact. For exact date, such as date of burn, suggested date for an event, etc. For exact time, such as meeting time. The surfer can select one answer by mark his choice. The surfer can select number of answers (multiple selection) by mark his choice. The answers to the selection are displayed in the drop down list, you can select only one answer. 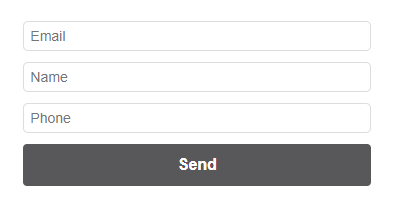 You can add one sending button to the form. You can add HTML code to designated form to the form. For each selected rows you can make change. Click on field element (regular, text line, text area, number, Email), will open a window where you can make changes to the field name, viewing options, limiting characters, setting a field as needed, adding user instructions, setting a range of values in a field, adding/removing rows in fields, and more. Click on select question field (Radio buttons, check boxes, list selection), will open window same as regular field element window plus options for writing the answers. For changing the form design fonts, size, colors, backgrounds and more, select style and change visibility. In the opened window select the area which you want to change, then you can select the property and set it as you want. Click on “Save design” for finish. Use Recaptcha – mark this option will add to the form, after publish, captcha in order to guarantee the answer is not Robot. Right to Left – mark this field enable text in the fields to be aligned Left to Right or Right to Left. Allow form filling once only – mark this field enable contacts to fill the form only once. Send you an email for each form – enable the account manager or the campaign manager follow after contacts detail which filling the form. Every time the form will update, an Email will send to the updated address with the updated details. Mark this field, will open additional window, for insert email address which we want the form updated sent to. If we want the details will send to more than one Email address, fill the addresses with comma between and no spaces. Send thank you letter after filling up the form – enable sending mail to contact right after he filled a form. Mark that field will open conversation report box where you can insert the letter subject, select the “Defined value” and the HTML file of the letter which we want to send. (For getting more details, please call the help center). Send SMS after the contact filled out the form – enable sending SMS to contact right after he filled a form. Mark that field will open conversation report box where you can type the SMS content. For Finish click on “Save and Exit” and go back to the landing page.